Published 5 July 2016 under Performances. 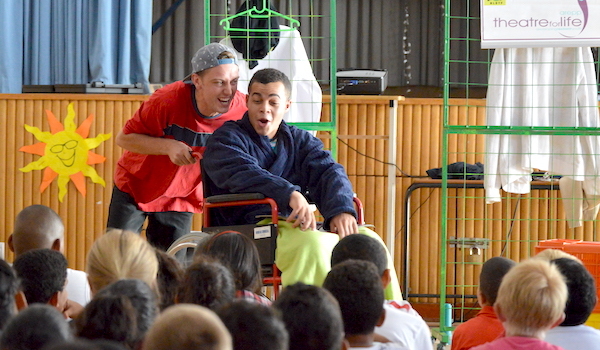 Thanks to the support of the National Lotteries Distribution Trust Fund (NLDTF) and the Western Cape Department of Cultural Affairs and Sport (WCDCAS), arepp:Theatre for Life produced an Applied Theatre presentation which was aimed at engaging youths in Grades 4 to 7 about HIV Education, Personal Well-being and Social Responsibility. With an amazing team, About Us: Playing For Keeps performed to over 5,000 learners in the Western Cape Metro education districts during the first school term of 2016. Both the Educators and Learners loved the show and felt incredibly positve about the impact of the presentation. To read more about the Playing For Keeps project, click here.